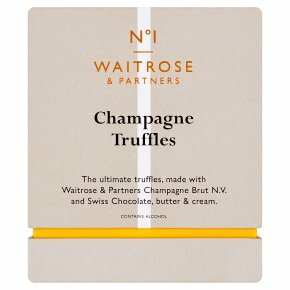 The ultimate truffles, made with Waitrose Champagne Brut N.V, Swiss chocolate, butter and. cream. Our truffles are made by a Swiss family chocolatier. They began in 1931 with their own teashop in. Berne, and soon gained a reputation for exquisite home-made truffles and chocolates. Today the. chocolates are made by the third generation of the family, who still use their grandfathers chocolate recipes. INGREDIENTS:Dark chocolate (49%) (cocoa mass, sugar, cocoa butter, emulsifier (soya lecithin)), milk chocolate (24%) (sugar, cocoa butter, whole milk powder, cocoa mass, vanilla, emulsifier (soya lecithin)), invert sugar syrup, butter (milk), Champagne (3%), Marc de Champagne (3%), wheat glucose syrup, cream (milk), humectant (sorbitol), sugar, emulsifier (soya lecithin), lemon juice from concentrate, sea salt.